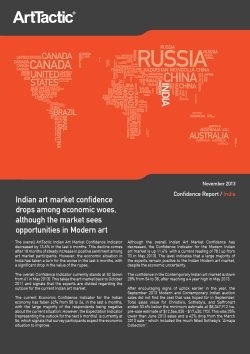 The overall ArtTactic Indian Art Market Confidence Indicator decreased by 13.6% in the last 6 months. This decline comes after 18 months of steady increase in positive sentiment among art market participants. However, the economic situation in India has taken a turn for the worse in the last 6 months, with a significant drop in the value of the rupee. The overall Confidence Indicator currently stands at 52 (down from 61 in May 2013). This takes the art market back to October 2011 and signals that the experts are divided regarding the outlook for the current Indian art market. The current Economic Confidence Indicator for the Indian economy has fallen 62% from 58 to 24, in the last 6 months, with the large majority of the respondents being negative about the current situation. However, the Expectation Indicator (representing the outlook for the next 6 months) is currently at 56, which signals that survey participants expect the economic situation to improve. Although the overall Indian Art Market Confidence has decreased, the Confidence Indicator for the Modern Indian art market is up 11.4% with a current reading of 78 ( up from 70 in May 2013). The level indicates that a large majority of the experts remain positive to the Indian Modern art market, despite the economic uncertainty. The confidence in the Contemporary Indian art market is down 28% from 54 to 38, after reaching a 4 year high in May 2013. After encouraging signs of uptick earlier in the year, the September 2013 Modern and Contemporary Indian auction sales did not find the zest that was hoped for in September. Total sales value for Christie’s, Sotheby’s, and Saffronart ended 33.6% below the minimum estimate at $8,347,912 (vs. pre-sale estimate of $12,566,035 – $17,430,170). This was 25% lower than June 2013 sales and a 42% drop from the March 2013 sale – which included the much fêted Sotheby’s “Amaya Collection”. The report includeas Modern and Contemporary Short-term and Long-term artist rankings for November 2013.